Crazy Florida weather! We finally get a cold snap with some 40 degree temperatures during the day and then three days later… high of 82. Sometimes I wish our weather was a little more consistent but compared to how it used to feel when I lived in DC – like the cold would go on forever and ever – I’ll take our short little bursts of cooler temps followed by warmth. Anywhoo – warm weather is the reason for my summery get up. 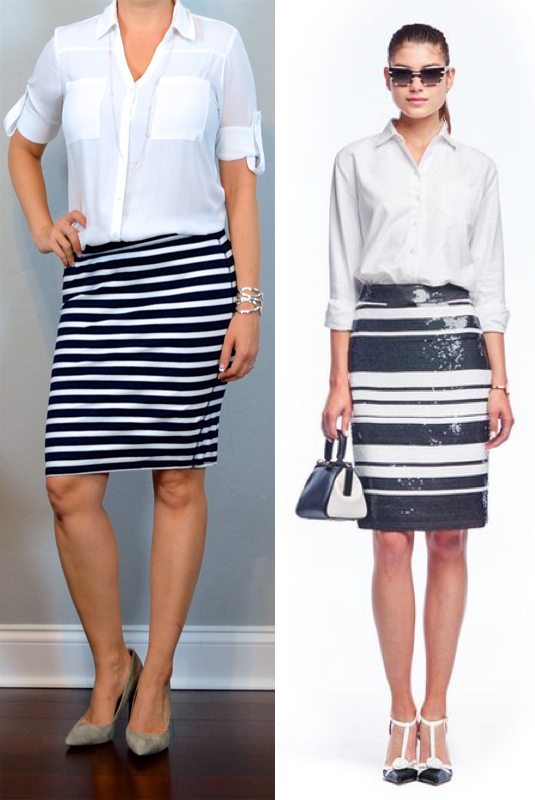 12 previous outfits with striped skirt here. Exciting news! My good friend Josh (the brains behind the the email job promotion course I linked to earlier this year) has a new book launching on Amazon today! It’s called Fearless Salary Negotiation and it’s a step-by-step guide to getting paid what you’re worth, and it’s specifically written for those who have full-time jobs and want to maximize their salary. I LOVE this outfit! 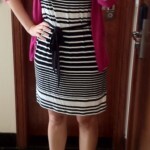 I love navy/white stripes and always have to restrain myself from adding more to my closet! Classic- looks great. Would like it if you could do a post and compare some basic white blouses. Especially ones that do not need a tank underneath. I will be glad when the sheer trend is done. 🙂 Thank you!